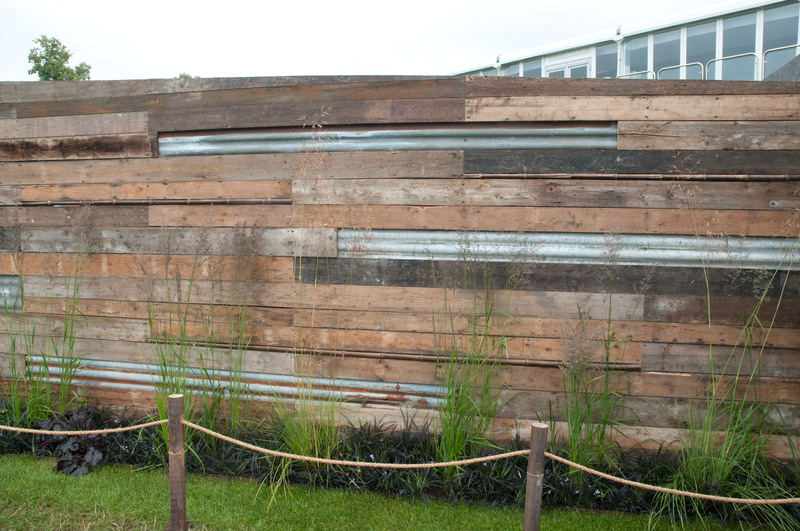 Hampton Court Flower Show 2012-it’s still huge! Hampton Court is huge and ever-changing and one new innovation that I really enjoyed was the creation of the ‘Low cost, high impact’ gardens. Just four of them this year, but definitely some of the best in show for me. And while I’m counting, it’s always good to get your bearings at the beginning of the show. Small gardens proliferated this year and I think I’ve calculated approximately 36 small plots to see (as well as the 12 large show gardens) if you include the Edible Bust Stop (seemingly floating around on its own in the yellow ‘Park Area’), Chris Beardshaw’s ‘Urban Oasis’, divided up into 8 distinct areas, 15 ‘Summer’ gardens and 8 conceptual spaces too. ‘Our first home, our first garden’ (above), designed by Nilufer Danis and recipient of a Gold Medal, had the lowest fixed budget of the ‘Low cost’ gardens, set at £7,000, but the simplicity of using reclaimed scaffolding boards as the only material for hard landscaping was a real winner. and the mini matching garden chair was a lovely perpendicular touch too. And talking if chairs, this witty and practical design by Will Sandy on the Edible Bus Stop area was another highlight of the show. Sandy is a landscape architect and through rejuvenating forgotten corners along the no. 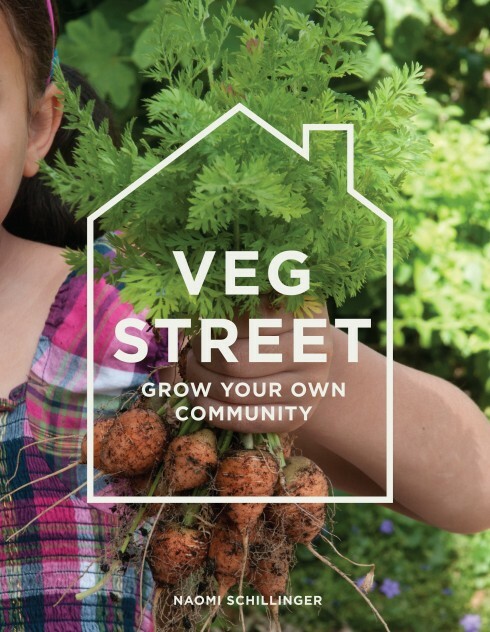 322 bus route in South London, aims to create thriving gardens which will both bring the local communities together and green up the urban landscape. 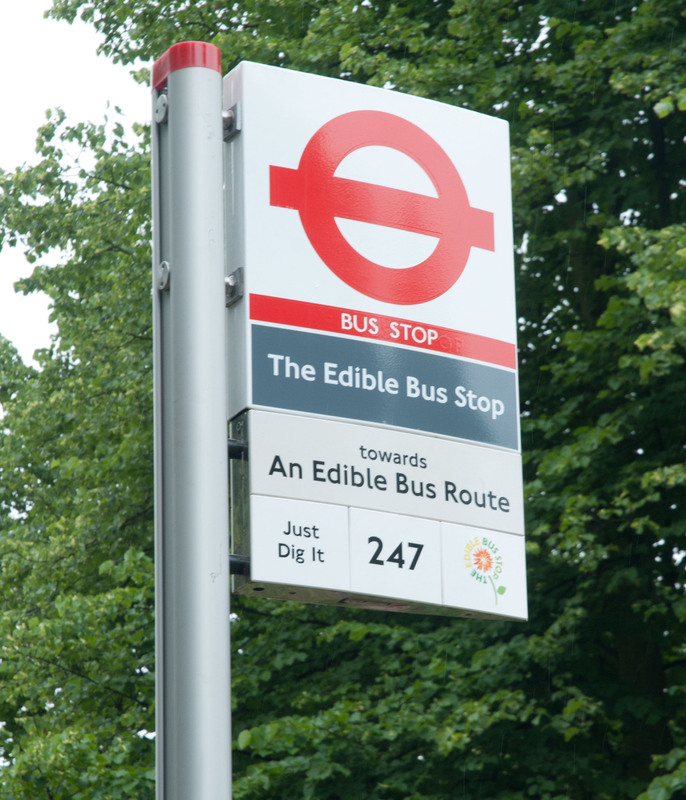 Successful meetings with Transport for London have resulted in their own liveried bus stops and livery on buses along their edible route too! 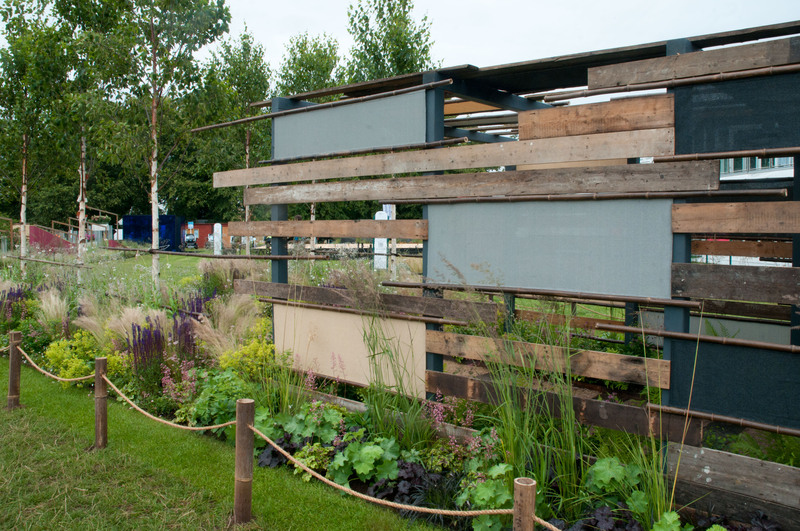 Edible landscapes were also very much part of Chris Beardshaw’s ‘Urban Oasis’ project, where 8 designed areas showcased again how ornamentals and edibles (often mixing the two together), could transform unpromising or abandoned urban areas to improve local communities. 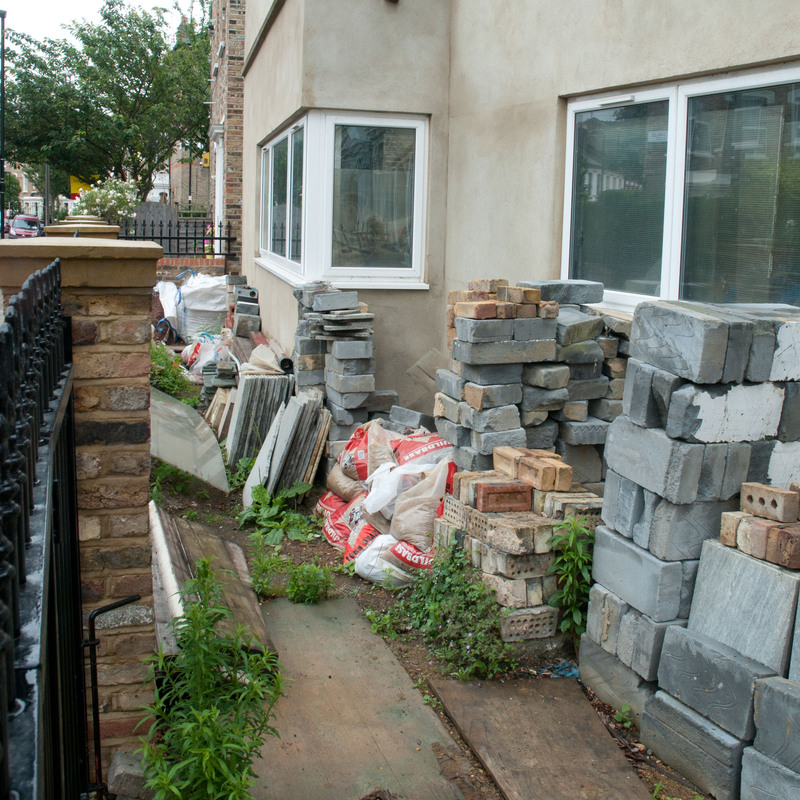 which reminded me that despite our best efforts to green up our own urban space in Finsbury park (through neighbours planting up tree pits and growing veg in front gardens), we also still have developers in our community who are happy to leave their projects in a half-finished state from one year to the next. (Note to self to contact local council and rally neighbours to take more action regarding this semi abandoned eyesore). 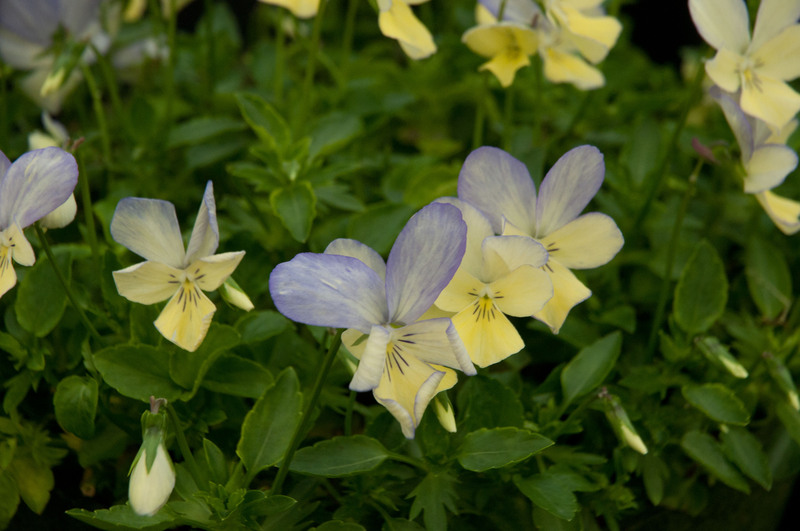 Back to flowers and loveliness, but also staying on the edible theme, I loved some of the Violas displayed by Victorian Violas of Lincoln in the floral marquee. And such a sweet delicate scent too. These unassuming flowers are fast becoming some of my favourite blooms in the garden, they’re a very decorative addition to a salad , and they grow well in pots too alongside lettuces and mustard leaves. and H. Red Twister looked rather delicious too. 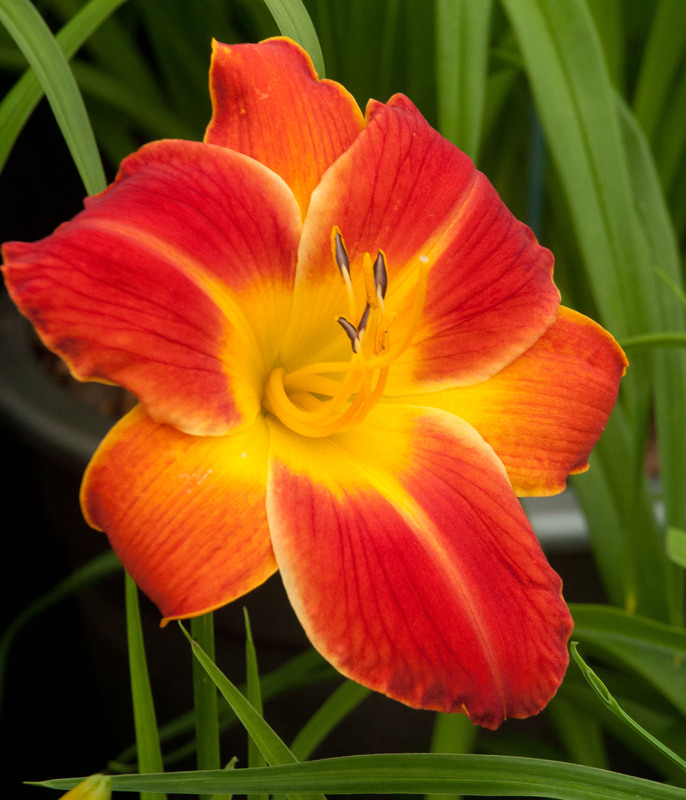 Mark Diacono in his ‘a taste of the unexpected’ book has intriguing recipes for both day lily fritters and hot and sour day lily soup. Just the time of year to experiment as mine are just about to come into flower. 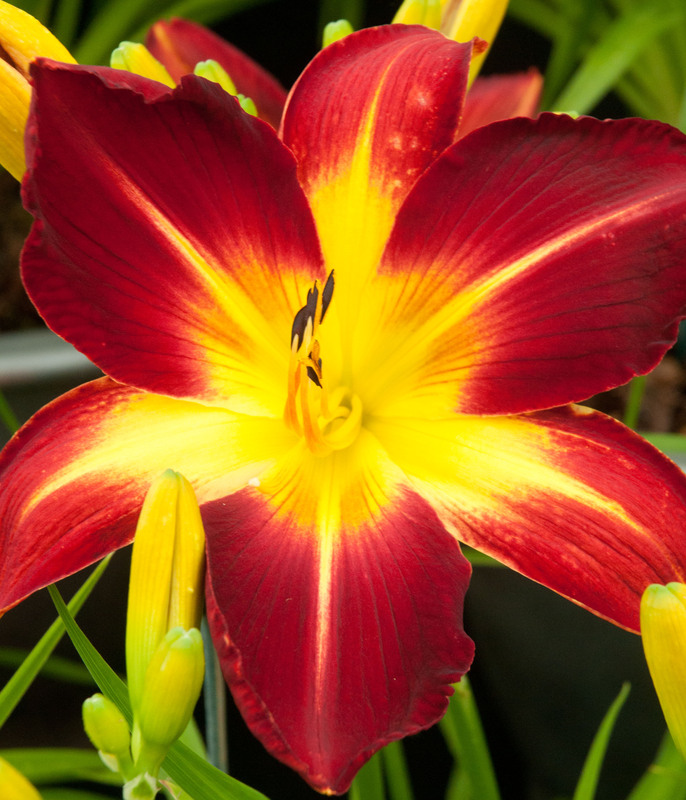 Paul Harris from Brookfield plants explained that day lilies probably grow best in the soil, forming large clumps, but will also do well in pots if fed in spring and kept well watered throughout the growing season. And for the first time, Mark Diacono had his own stand at Hampton Court, displaying a tempting array of edible perennials, shrubs and trees from Otter Farm in the ‘Growing for Taste’ marquee. I was rather taken by this Szechuan pepper tree with its light, open, spiky habit and edible fruit of course. 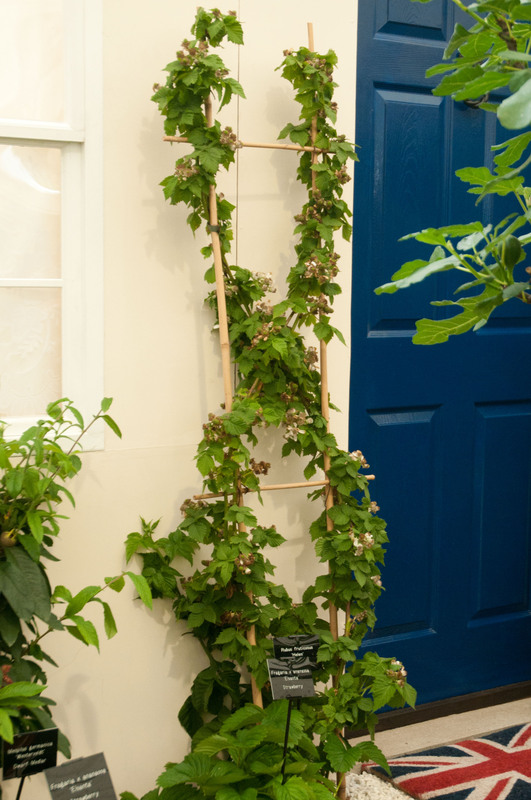 Although it can eventually grow up to 7m high (but will respond well to heavy pruning), Mark Diacono had a 5-year-old plant that was about 10 feet tall on his stand. A great size and habit for smaller gardens and it will grow happily in pots too. Definitely a purchase for the future. and Blackberries decoratively trained for space-saving fruity nibbles on the doorstep. 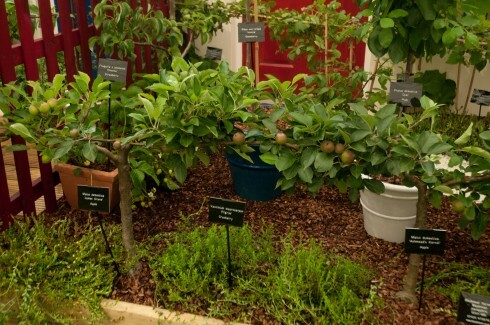 Unlike Chelsea, edibles were really the flavour of the show at Hampton Court this year. 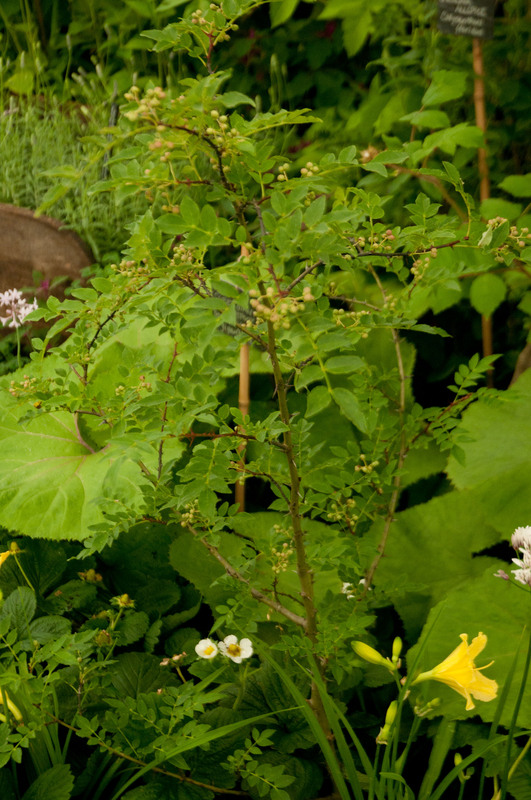 and some choice planting including sea-kale and the joyous Berkeyha purpurea above. As I journeyed back to the exits, I came across these groovy bird feeders on a stick. 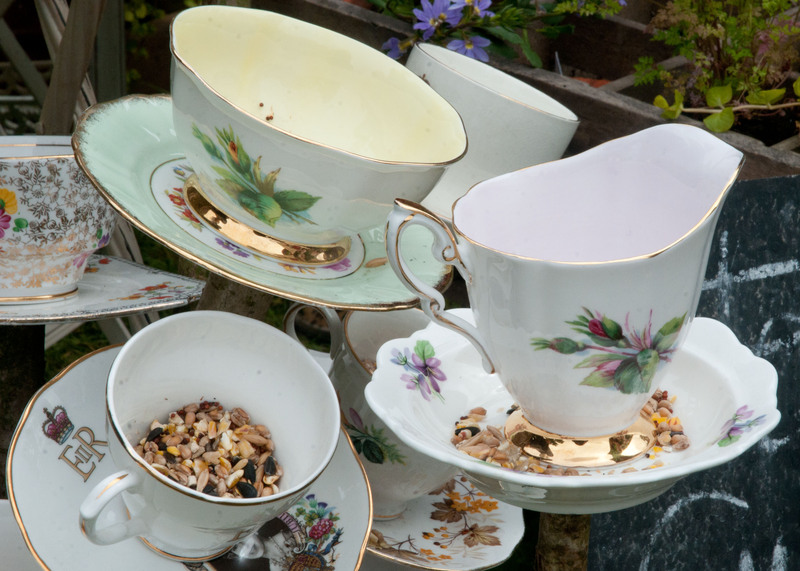 A great way to recycle old tea cups and saucers, although I imagine squirrels in my garden would think I’d invited them to their own deluxe tea party. The creations were part of the Pretty Nostalgic Magazine stand, promoting British-made, ‘up-cycled’ and vintage goods. 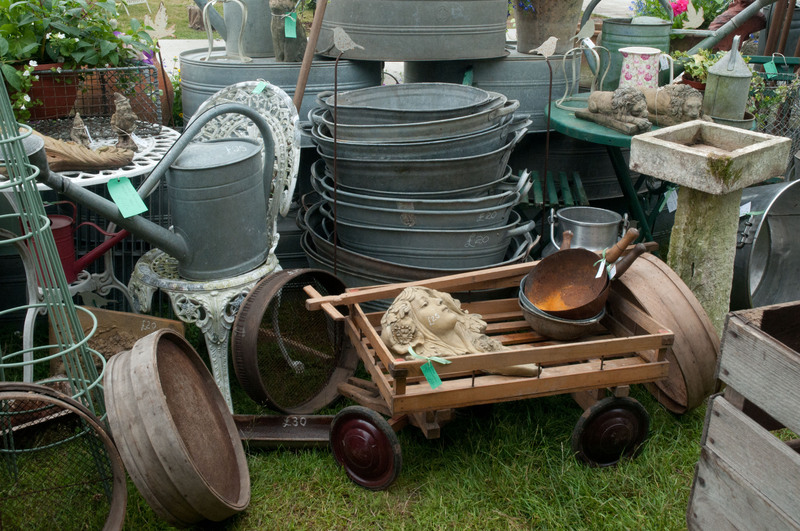 Garden Brocante also had great quality vintage tools and planters on offer, although travelling back on the tube with a tin bath was less than appealing. My advice. Drive if you know you’re attempting a gardening shopping spree! 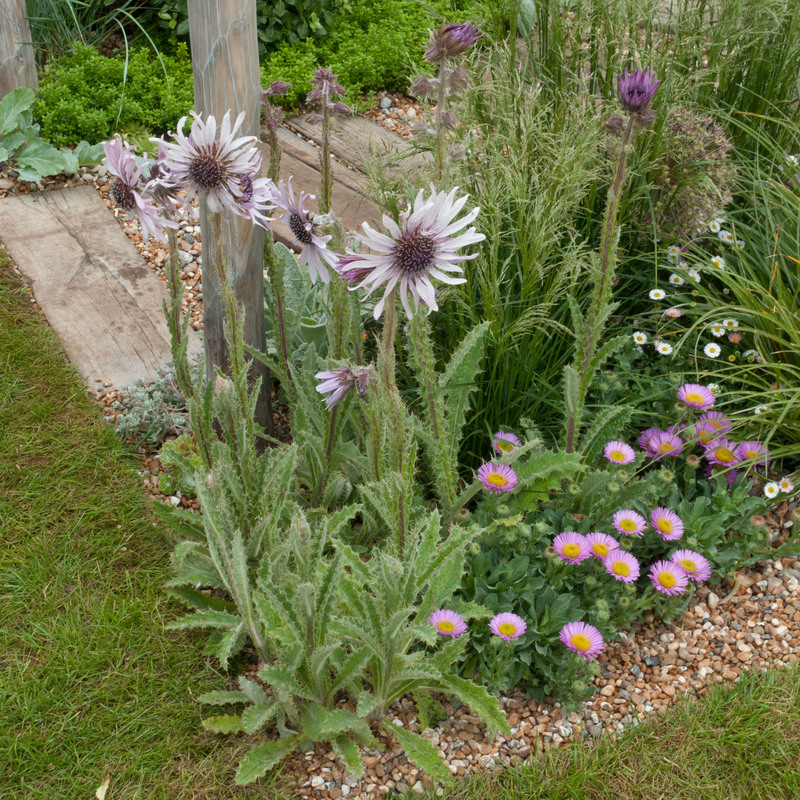 In the third small garden category, where 8 designers of conceptual spaces were awarded £6,000 towards their garden build, Matthew Child’s Gold medal winning ‘A Light at the end of the tunnel’ garden impressed with concept, planting and materials. The solid make do and mend cladding gradually thinned out to a more open structure, artfully echoed in the planting as damp moss and ferns in the interior of the tunnel progressed to flowing grasses and the vibrant frothy heads of Alchemilla mollis. A real treat of a garden. 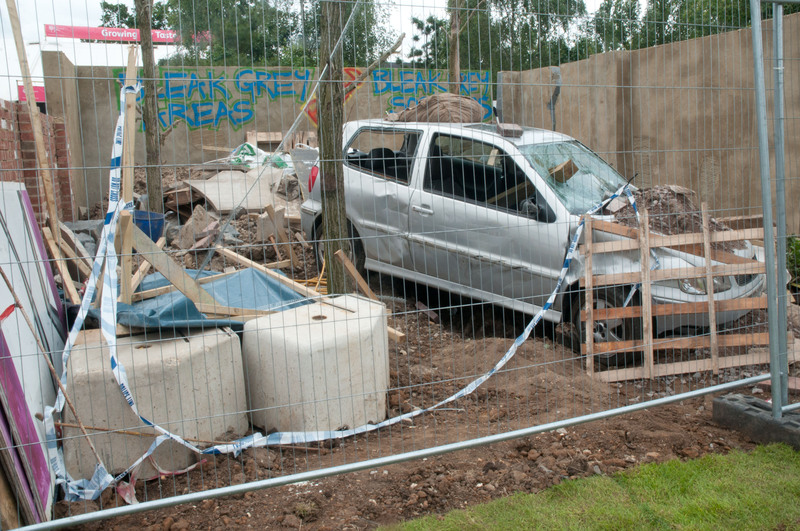 Daniel Shea’s conceptual Silver winning ‘Uprising’ garden was designed in response to the Tottenham riots, where he ‘explores the benefits that …naturalistic planting can bring to urban environments’. 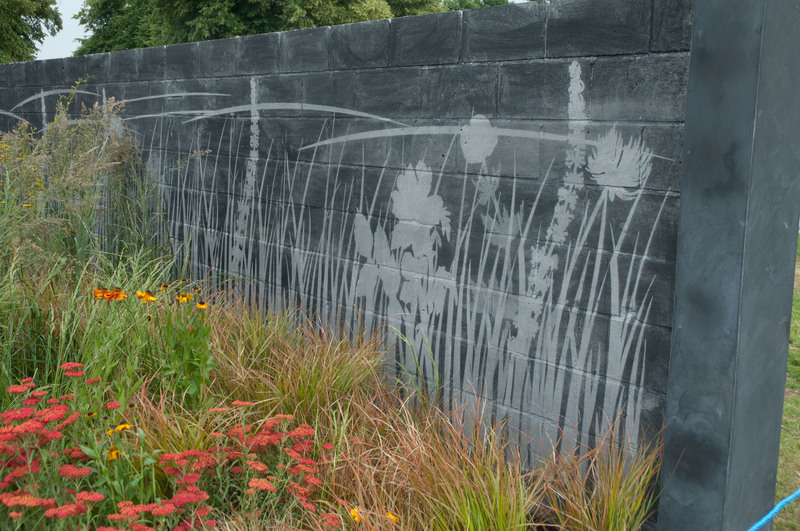 Lots of rich fiery planting, calmed by the soothing grasses and the decorative breeze block walls were a lovely ghostly backdrop to the garden, created by pressure washing the charcoal darkened areas off the wall, using a stencil for the design. Great idea! 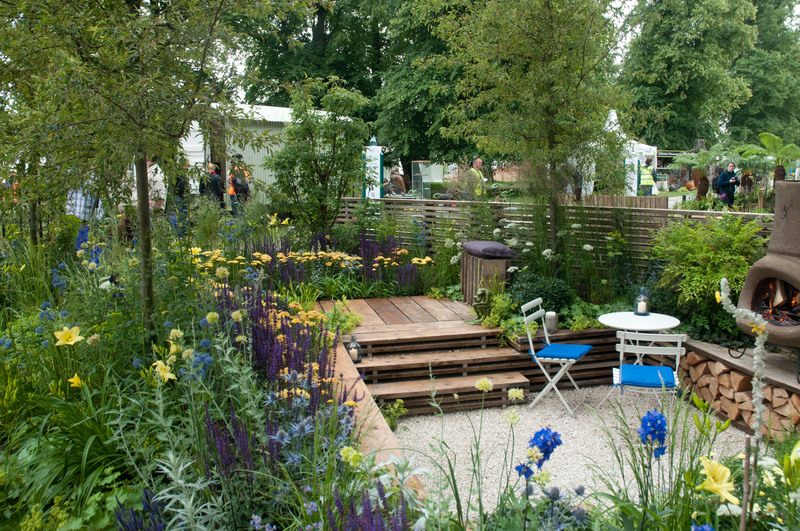 And finally, ‘The Coral Desert’ created by Pod Garden Design. 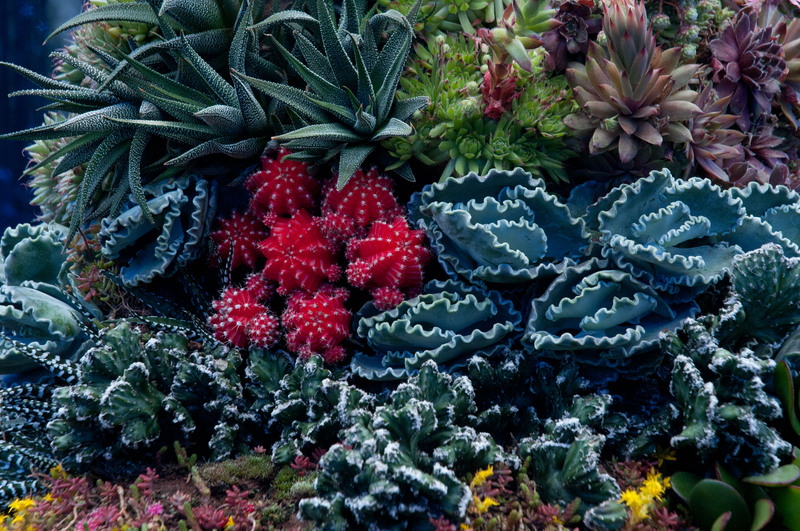 Antonia Young and Mark Yabsley have quilted together many different cacti and succulents to highlight the fact that many coral reefs are in danger of destruction around the world. Beautiful use of textures did evoke these delicate underwater ecosystems and the pair have deservedly come away with a Silver Gilt medal for this incredibly detailed garden. I thoroughly enjoyed my day out this year, if somewhat overwhelmed by the size of the show, and coming away with a nagging feeling that I may have missed a chunk or two of gardens to visit along the way! There’s loads of time to go and visit as the Flower Show continues daily from 10am -7.30pm until Sunday 8th July (when it finishes at 5.30pm), and there’s still plenty of whole and half day tickets available. Wear sensible shoes (and not jeans that will soak up all available moisture from the ground as I did last year), take a brolly and you won’t be disappointed! I’m off there tomorrow, Naomi. Everyone is saying how vast it is so getting a little worried I won’t have the stamina! Looking forward to the Growing for Taste tent. Guess I’ll just have to be selective about what we see. We’re driving over from Wales so it’ll be a long enough day as it is. Thanks for the tips Naomi. I’m hoping for a dry day. It’s been wet here all day. Has it been wet over there, just wondering whether I need my wellies or can I do without them for the day? has been raining on and off most of day, but not that heavily. Might be a bit muddy, but lots of paths to follow. Maybe tweet to see if anyone there can tell you? Looks much more inspiring than Chelsea this year. I love the make do and mend/upcycling theme – the garden with the recycled scaffolding (not least because it also has a lot of plants), and the teacups on sticks. (I wonder if they could be birdbaths so as not to feed the squirrels. Or too small?) 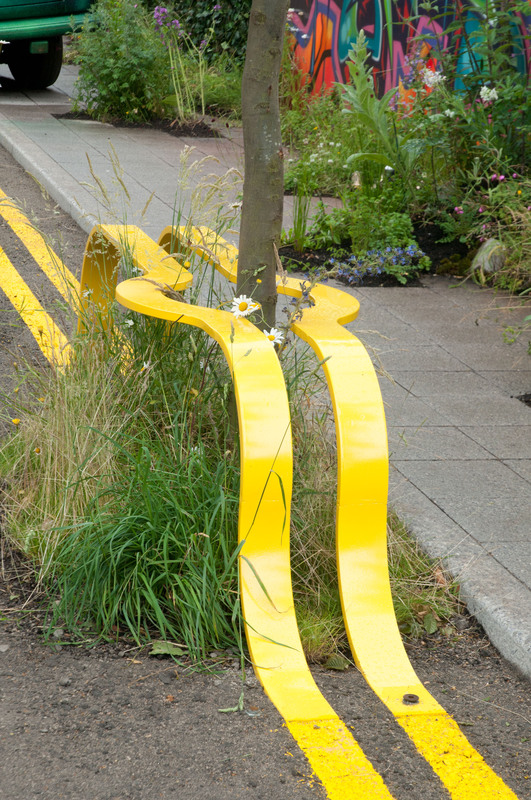 And the edible bus stops are wonderful – the yellow double line stand genius. 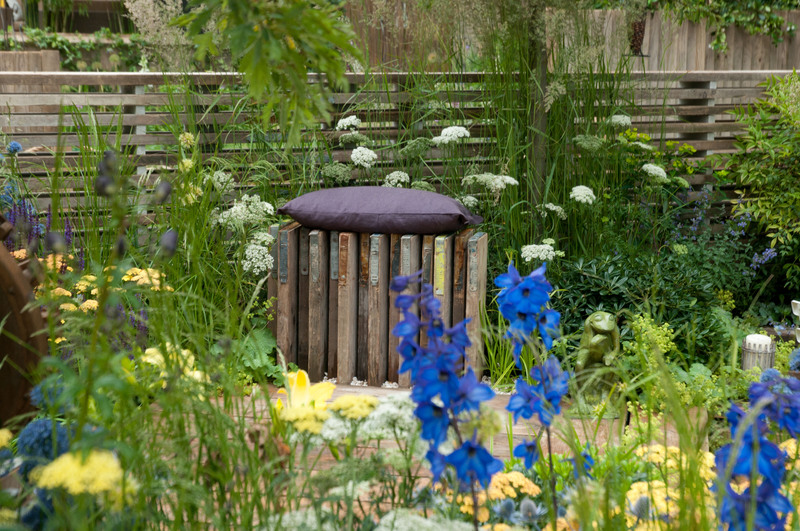 Hi Nicolette, Yes, I think the double yellow line chair stole the show for me on the design side, and I loved the mixing of herbs, fruit, veg and flowers in some of Chris Beardshaw’s gardens too. 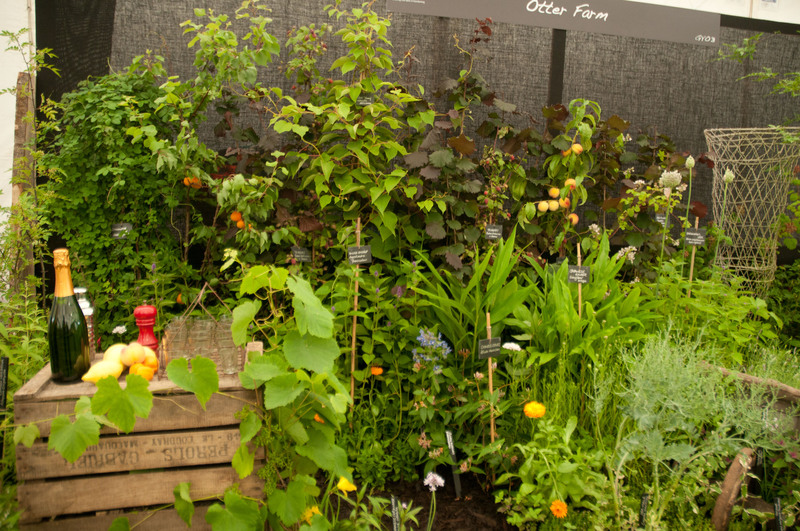 Did miss fruit and veg at Chelsea this year, so great to see it in such abundance at Hampton Court. I agree with Nicolette it looks less conventional and more daring than Chelsea. 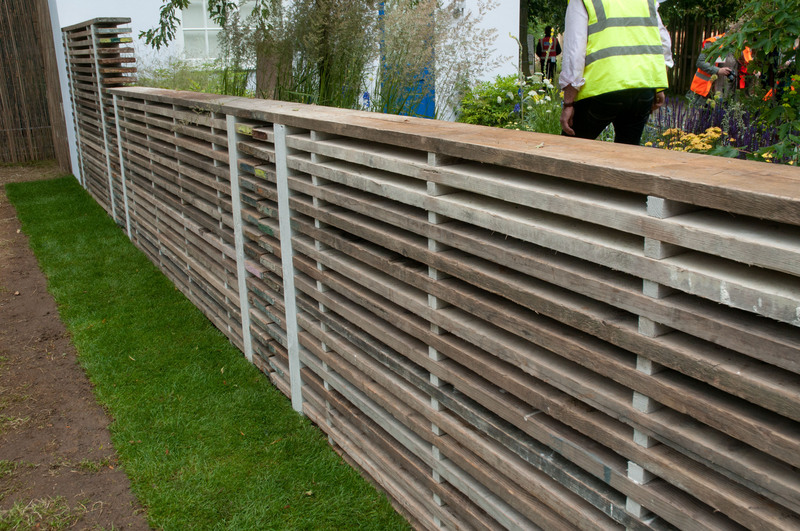 I love the recycled materials softened with some excellent planting. I am a big fan of economic garden design, I like the plants to create the drama as much as possible. 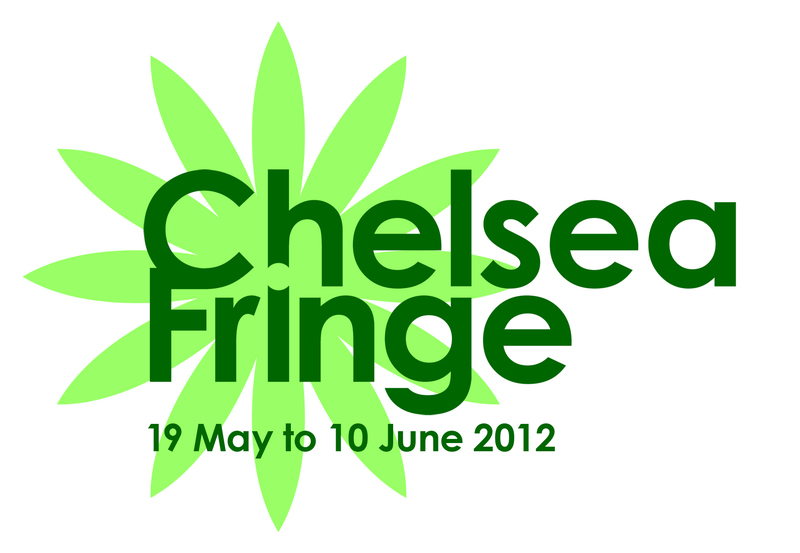 Hi Sue, Yes, very different feel to Chelsea. Went on press day this year which was slightly odd, as most stands were devoid of owners (as judging was yet to take place). Unfortunately this meant not many nursery people talk to, so will be visiting with the masses next year I think. Enjoyed it none-the-less though! II was very surprised to hear they are used in recipes, though!! When left to wither and die naturally, they drip a black inky substance that seems to have dye properties. Was that mentioned at all as a byproduct? Mine bloomed so huge I felt the need to measure the diameter–all were at least 16inches with a few as wide as 18! Hi Karen, Ah, your sunny and very warm clime! Hemerocalis is just about to bloom in the UK for the first and certainly only time this year as it’s been so wet and cold. !6 inch blooms are not going to be appearing this year (or any I suspect) too, but really interesting to hear how big these flowers can get to when grown in Florida. Didn’t ask about using it as a colourant as I’m obssessed by edible flowers at the moment and can only handle one obsession at a time! 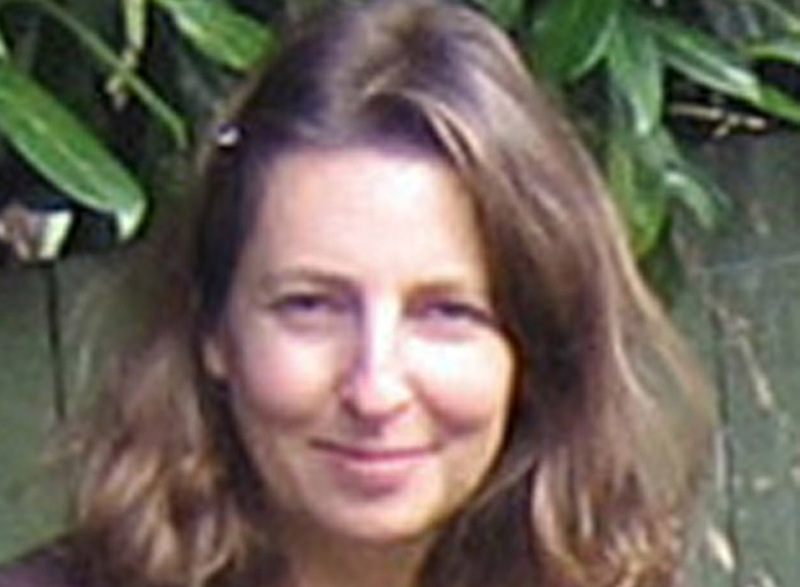 Hi Ursula, It is a big show, but good to have a focus guiding you around the site. I was really looking at edibles this year, although the odd gorgeous bloom did catch my eye! 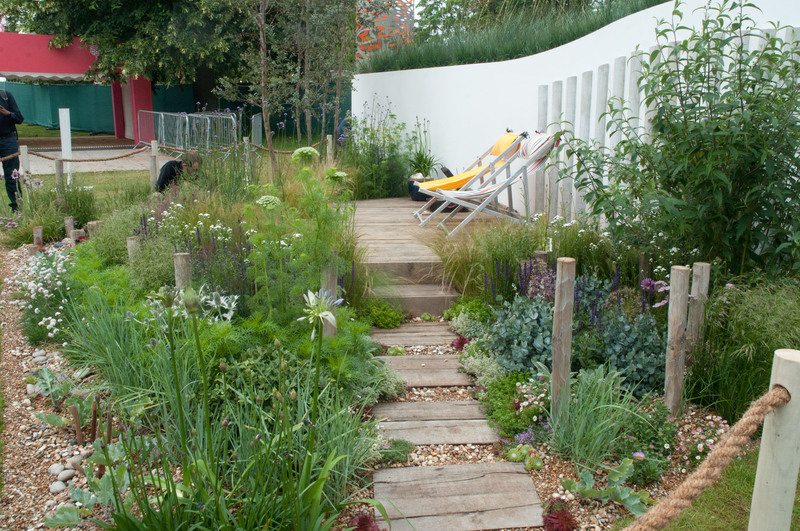 And design too-you’re right, the small gardens did seem packed full of interesting ideas, many of which could easily translate to your own home. Yes, definitely worth the trip! Just read this great post and then did a little digging around your website and realised that I know you from way back. A comment from Martin Grover on your About page confirmed it. Anyway, I’m living in Australia now and missing English gardening and garden shows like mad. Good to hear from you all the way from Australia. As it happens, seeing Martin Grover this afternoon, visiting one of his exhibitions in S. London. Are you gardening in Australia? Where are you and what’s the climate like? Glad you enjoyed the post and would be really interested to hear what you’re growing in Australia. Despite the ceaseless rain these last 4 or 5 months, it’s still been a good gardening year here, but maybe without ripe tomatoes. Look forward to hearing what gardening you’re up to in Australia. 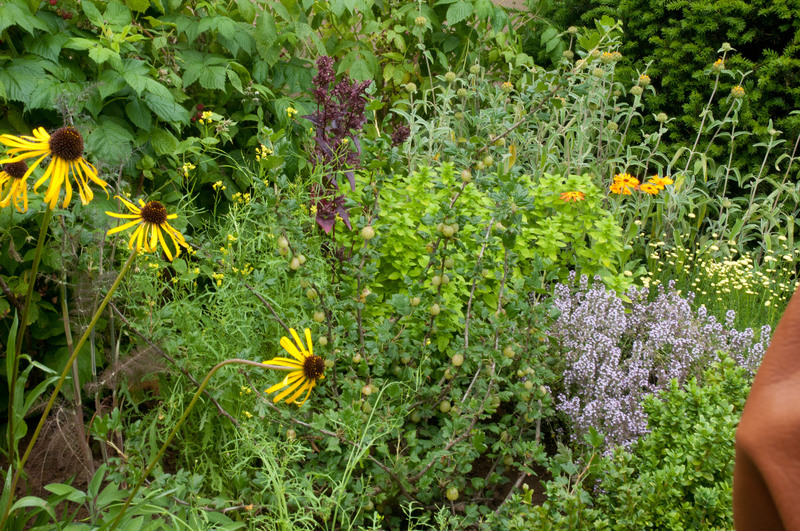 We’re living in Sydney, so climate is good – no frost but too humid for lots of perennials. I’m not growing much at the moment, partly because we’re renting but partly because everything we plant (apart from spiky natives) gets eaten by wallabies and possums. We’re in a suburb of the city but it’s quite a bushy area near a national park, so there’s lots of voracious wild life. I’m missing plain old slugs and snails (though we’ve got them too). I thought it was probably a slugfest there at the moment, given the weather. Yes, I guess it’s human nature or maybe my nature, but when I was in the UK I loved to grow exotics, including quite a few Australian natives, because they could be quite a challenge. Now, I hanker after all kinds of things english garden favourites that don’t do well here.